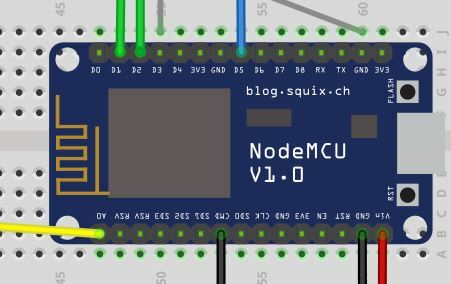 In our part 1 of this article we learned how to take a stock nodemcu esp8266 and flash it with the latest version of nodemcu. We also learned how to send and run files onto the unit using ESPlorer. In this final part 2, we will finally get to the guts of the how to set up a NodeMCU ESP8266 which provides a web interface for relay control, 12v battery monitor, and wifi configuration. NodeMCU default behavior loads the init.lua script on boot. When beginning to code and test out its functionality, its a good idea to just load your setup parameters in the init.lua script and for the init.lua script to call another lua file to run the bulk of the code. This lets you comment out the auto loading of the secondary lua script and lets you load it manually using the ESPlorer tool until you are certain the code doesn’t cause a kernel panic and leave you in an endless bootloop. I ran into an issue where I didnt do this, and my ESP8266 bootlooped. I then needed to reflash the unit with a lower version of firmware, then reflash the unit with the newer firmware in order to wipe out its filesystem contents which contained the crappy code. What a waste of time. wifi.setmode(wifi.STATION) --Set network mode to station to connect it to wifi router. You can also set it to AP to make it a access point allowing connection from other wifi devices. OK back to the topic at hand which was creating a wifi connected battery charger which can also allow me to monitor the battery voltage on my deep cycle battery left in Shasta. Whew! Remember that R1 is the resistor closest to positive and that R2 is the resistor closest to negative (ground). If you get a small ceramic disc capacitor, the leads are not polarized and can be connected whichever way. Dont forget to connect the NodeMCU board GND to Battery GND or the analog read values will be wrong. 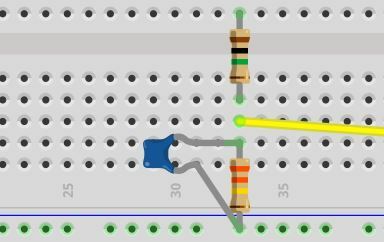 I know in the illustration above, the LED leads are reversed and I also didn’t add a resistor to the LED (but the LED seems to be fine). I didnt show how to connect the relay to the power switching of the battery charger as your needs will be a little different from mine. But I am using one relay to control the AC input into the charger, and the other relay to disconnect the positive battery lead from charger to battery so the charger will not inadvertently drain the battery when left connected. The ESP8266 Analog read pin (A0) on the NodeMCU development board has a voltage maximum of 3.1v. If using a bare ESP8266 module (such as an ESP-12) it is a voltage maximum of 1 volt. Since were using the development board, we will be finding resistor values to divide the 12-15v coming from the deep cycle battery into a reading the analog pin can sample, anything under 3.1v. Be aware that the higher the resistance of the resistors, the lower the readings you’ll end up seeing at the analog pin in the ESPlorer console. If you choose a ratio of 10k ohms and a 3300 ohm resistor , then you’ll see a higher analog dc read value on the pin vs using a 1M ohm and a 330k ohm resistor (which is what i’m using). The reason that i’m using higher resistance value resistors is because i’m trying to minimize current drain when the circuit is left connected. If I am understanding this correctly, using this resistor combination only draws about 6 µA. If youre already overwhelmed, just keep in mind that the main idea is to divide the large 12-15v of the battery into a smaller voltage we can sample with the analog read pin on the NodeMCU board. Once the big (12-15v) voltage is divided and within the range the ESP8266 can coherently sample (below 3.1v), we just need to configure the software side of things to make everything work. If you’re like me and this is your first electronics project requiring software and hardware all working together, the above heading will probably sound like you…its what I sounded like when trying to wrap my head around this analog read calibration concept. Its simple once you get your head around it though. Once we have our voltage divider working as it should, it will bring the voltage down to a level our analog pin can read (from 0-3.1v). However, the values shown by the console output wont display the voltage of the battery as we recognize it, but will instead show values in the range of 0-1024. This doesn’t help us much, so we just have to apply a little division to get real world values (the voltage level) from the 0-1024 reading. 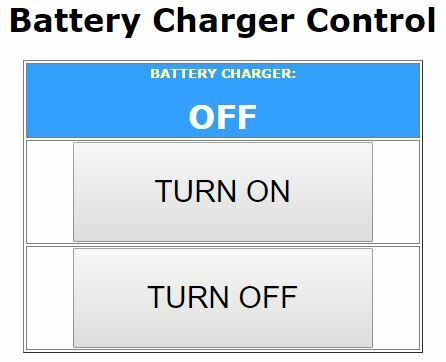 In this case, we test the battery with a calibrated and known working multi-meter to get the current voltage of the battery, then do some division with the the ADC Value reading we get in the console when you click on the ‘READ DC VOLTAGE’ button on the battery charger control webpage. Now just use that LSB number to replace the LSB number in the main.lua script below and your voltage reading will be calibrated for our project! Now that we have the ESP8266 running a current version of NodeMCU and are able to control it with ESPlorer, we can finally get to the fun stuff, running scripts! I’ve provided the code snippets below to peruse, but you can also just download the init.lua and main.lua files below to upload to your NodeMCU unit immediately. Both these scripts combined produce the webpage shown below and make everything work. The init.lua file in my project does all the wireless heavy lifting. If the unit is powered on and does not establish a connection to an access point, it will then configure itself as an access point with SSID of “BatteryNode” with password of “password” which you can then connect to using a phone or computer. Once your device is connected to the “BatteryNode” access point, you then navigate using your web browser to 192.168.2.1 to bring up the battery charger control webpage (make sure you turn off mobile data if the phone does not detect an internet connection using the “BatteryNode” AP or you wont be able to navigate to the IP). After the webpage loads, at the bottom of the screen is a section to enter the SSID and password of the access point you want the NodeMCU battery charger unit to connect to. Be aware that the information you enter is case sensitive. Weird hangups or kernel panics happen when you don’t enter the credentials exactly. If you enter in an SSID that does not exist, the unit will kernel panic and reboot. If you’re going to be using the ESP8266 unit on a different subnet than specified in the scripts, you’ll need to change the IP configuration in the init.lua script to match yours. You may also just comment out the lines below in order for the unit to get its IP address using DHCP. --NOTE: If using a mobile phone you may need to disable data when connecting to the AP IP set above as it may try to connect over the data connection instead of through WIFI if the phone detects no internet access when connected to the AP. Main.lua handles the main processing of commands, it sets up the pins, defines the variables, and serves the website. Remember the LSB value you calculated earlier? You’ll need to remember to replace the LSB value in the main.lua file with your own LSB for it to correctly show your voltage on the webpage. 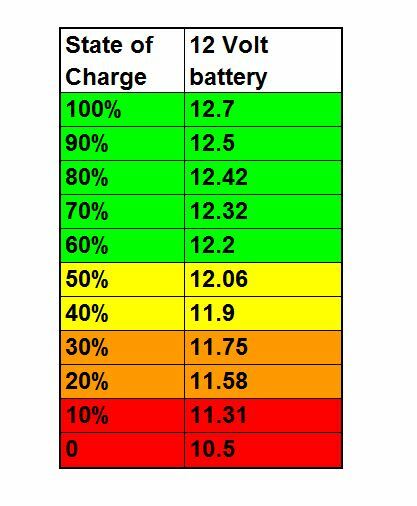 The readings will also change color of the voltage reading based on the following table (I skipped the orange color so its just green, yellow, and red). -- The battery charger I use maintains the battery voltage at 13.3v - 13.4v, this is the float charge. Therefore print float charging... instead of voltage level. --SSID and PW are case sensitive. If wireless info is not entered case sensitive the ESP will hang up. If the SSID and encryption is incorrect, the ESP will Kernel Panic and just reboot. --Restart ESP in case it hangs on re-connection. This will prevent MCU from being unreachable. --New NodeMCU 1.5.4+ firmware fails on older NodeMCU v.9.x multiple send commands, so needed to do a new method to send. There you have it, a guide which should allow you to have a fully functioning ESP8266 webserver which allows you to control a relay (which controls a battery charger), monitor the voltage of a 12v battery, and configure the wireless settings without needing to upload any new lua scripts. This was tested on a NodeMCU development board v0.9 with NodeMCU version 1.5.4.1. I’m sure the scripts could be optimized and reduced in size, and I welcome any tweaks or comments to anything i’ve written above. What i’ve essentially done is taken some smoothly written code from all over the internet and adapted it for my purposes. Below is a list of the resources I used to help build this project. They were the few articles that were written in a way where I could understand and also adapt for my own use. I couldn’t have done this project without them. 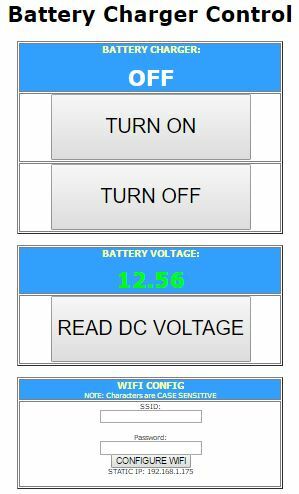 Read Part 1 on how to set up a NodeMCU ESP8266 which provides a web interface for relay control, 12v battery monitor, and wifi configuration. 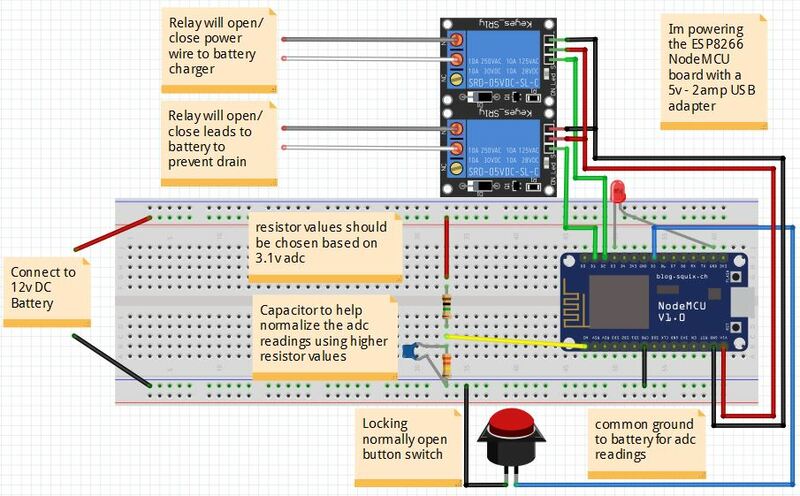 This entry was posted in Computers, Hack and tagged 12v, 12v deep cycle, adc, analog read, battery, configure wifi using browser, dc, esp8266, http, led, monitoring, nodemcu, relay, tcp server, webpage, webserver, wifi access point, wifi client on September 29, 2016 by Blog Master. I’ve been wanting to tackle this for a while now and I finally have the time to try it out. I’d also like to find the amount of current the load is drawing. Could that be built into this also? If so, would you be able to provide some help with that? Thanks for your work and writing this out for those of us with little experience. You’ve made it really easy to grasp. I wish there were more tutorials out there like this. This is rely good, but I cant connect to home router? Is there any here up fore a job control 4 channel rely over web using nodemcu I rely like to here about it. Hi there .. What a great article ..thank you ..very insightful indeed. Would you happen to have arduino code for the same project ? For the value to continually update, you would need the screen to refresh every few seconds since it is plain HTML. You would also need to call the function every time the page is loaded. good evening I was trying your code I have appropriately modified the resistive divider for 1-100V. Do you help me for this update every X seconds?